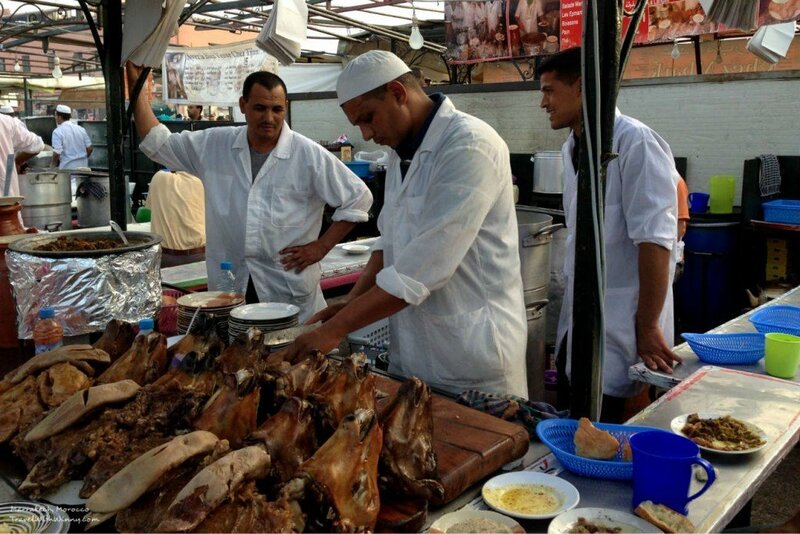 What to Eat in Marrakech? 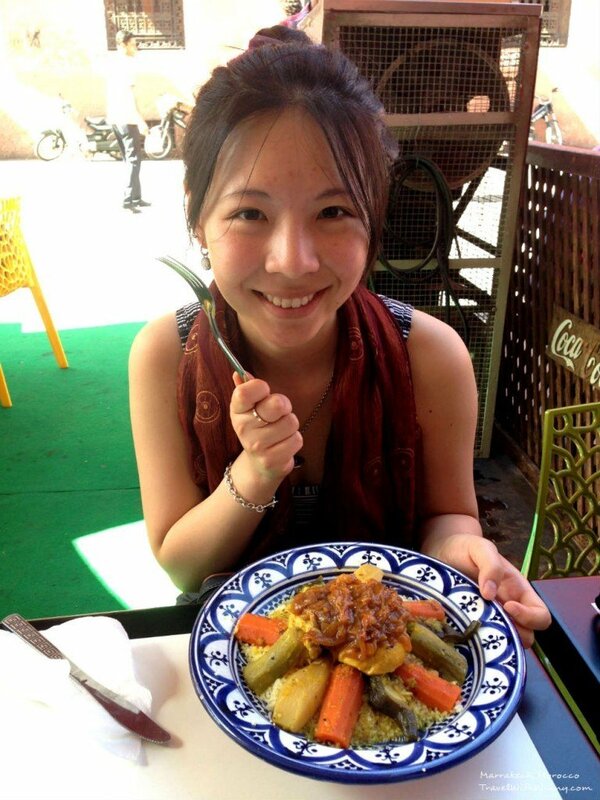 Ever since I came back from Morocco, I have always wanted to show people what to eat in Marrakech. Discovering what to eat there was the highlight of our trip, since both York and I love to eat! 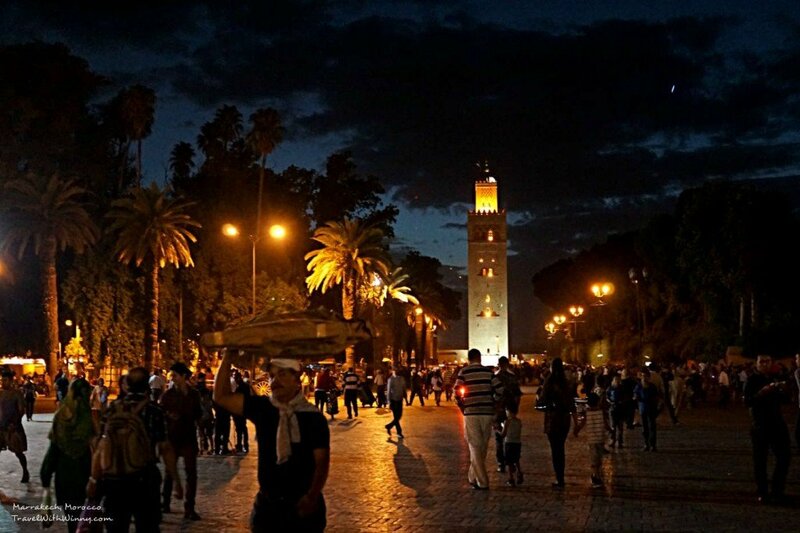 Marrakech is the fourth largest cities in Morocco, it is about 3 hours drive away from Essaouira (the place where we have spent our past 2 days indulging in seafood. For further reading please click “Essaouira: Our Seafood Heaven in Morocco“). The city is also known as “The Red City” due to the amount of red sandstones used during construction. Red walls everywhere, hence the name “Red City”. Djemaa El-Fna in Marrakech is one of the most famous squares in Africa. It has been part of UNESCO World Heritage Site since 1985. There are many merchants, snake charmers, dancing boys here at night-time. Giving a magical exotic feel. The music, people dancing, it was a sensational feeling. One must come experience here first hand. Djemaa El-Fna in full swing at night-time. 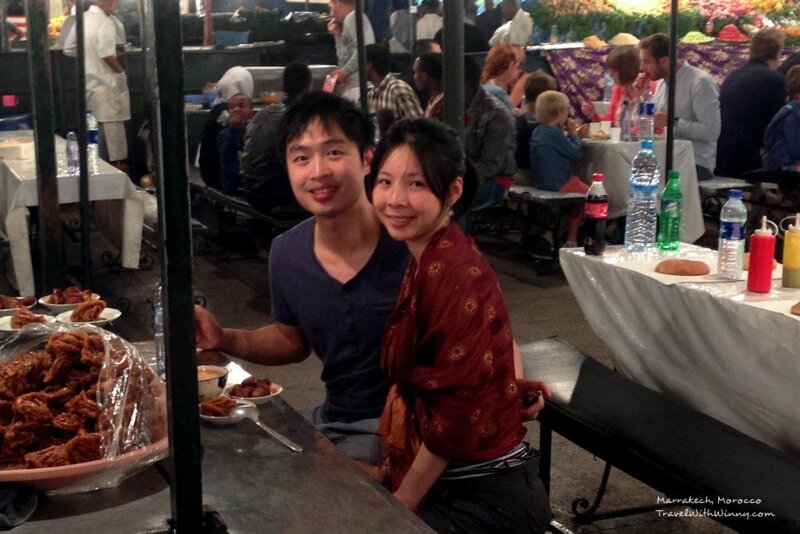 Each night in Djeemma El-Fna, stalls are set up beneath giant tents selling different types of food. They are all licensed by the governments, hence they are quite safe to eat. Each section sells different types food, each with similar prices. They usually have menus printed in French, English and Arabic. This makes it less likely to get ripped off. However many will charge you extra 5-10DH for the bread and olives that supposedly free. Sometimes they may even calculate the bill wrong or give tourists a smaller portion of food. 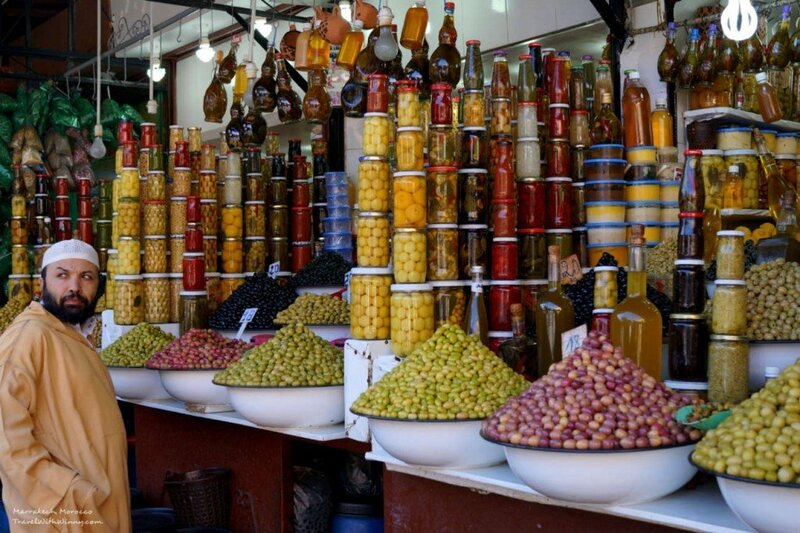 Colourful olives in jars and open air @ Marrakech. This is a normal tajine, I love Fig targines, usually gone before I have the chance to take a photo. 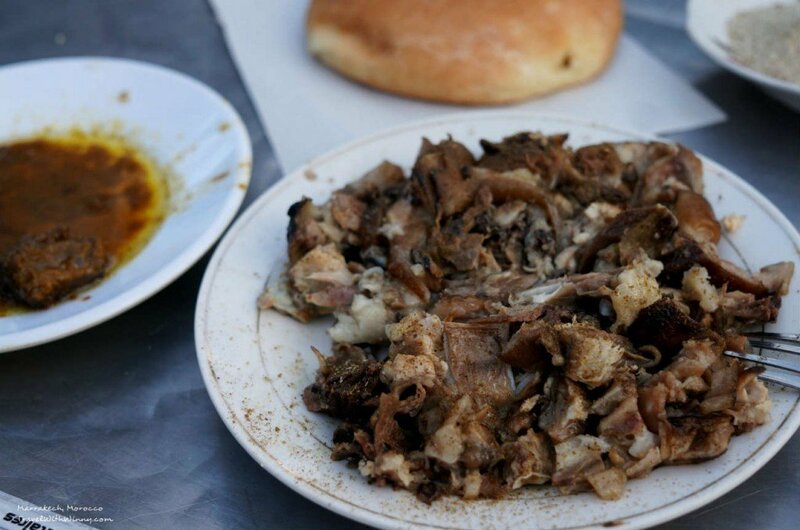 When we were watching discovery channel on Morocco, we told ourselves we have to try the lamb head, no matter how disgusting it looks. 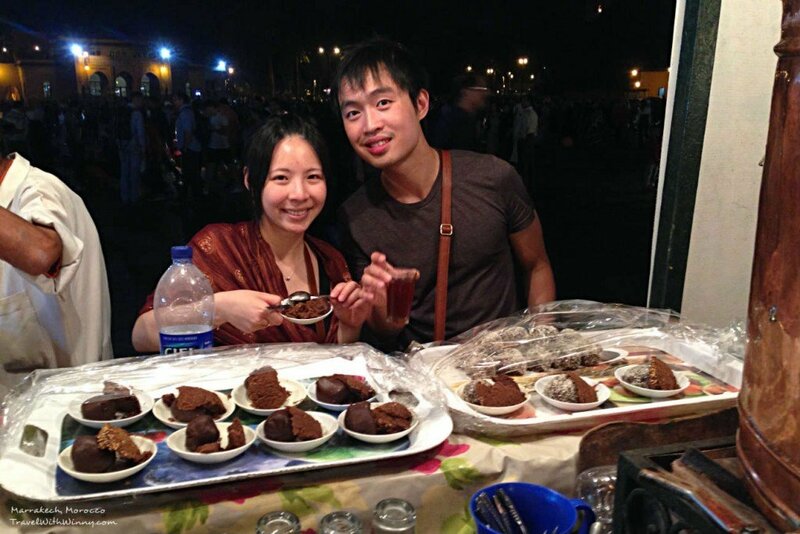 When we got to Djemma El-Fna, there were so many stalls selling the same thing, it was hard to pick which one to go in. 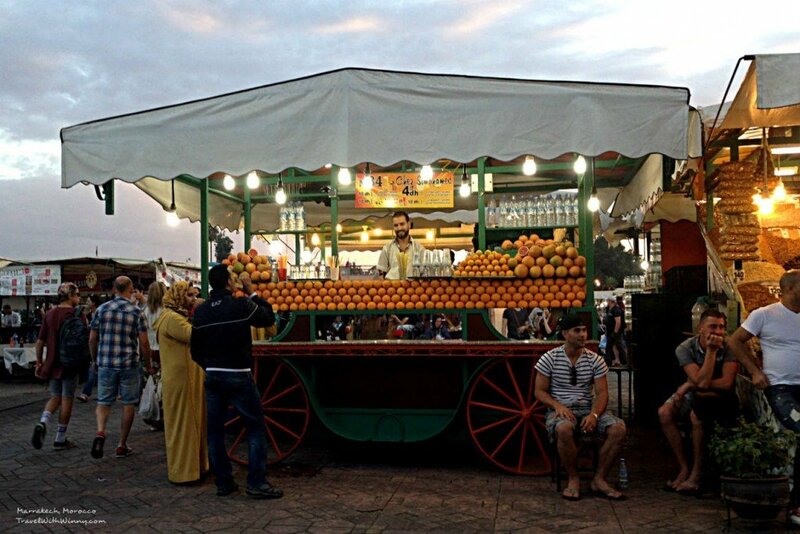 Usually we would choose a stall with the most locals, however as it was our first meal in Marrakech, we decided to go into a stall where the greeter speaks reasonable English to avoid confusion on what to order. Such an amazing sight with all those lamb heads. We were given an English menu and some cutleries. The price of the lamb head is depending on the portion. 1/4 lamb head was 18DH, 1/2 lamb head was 30DH and a whole lamb head was 70DH. They did not give us the lamb heads on display, instead there was a huge pot behind the chefs where they took out a fully braised lamb head and chopped them into unrecognisable pieces. Close up shot of the lamb heads. The lamb head actually tasted pretty amazing. There were no foul smell of lambs and it was very tender. 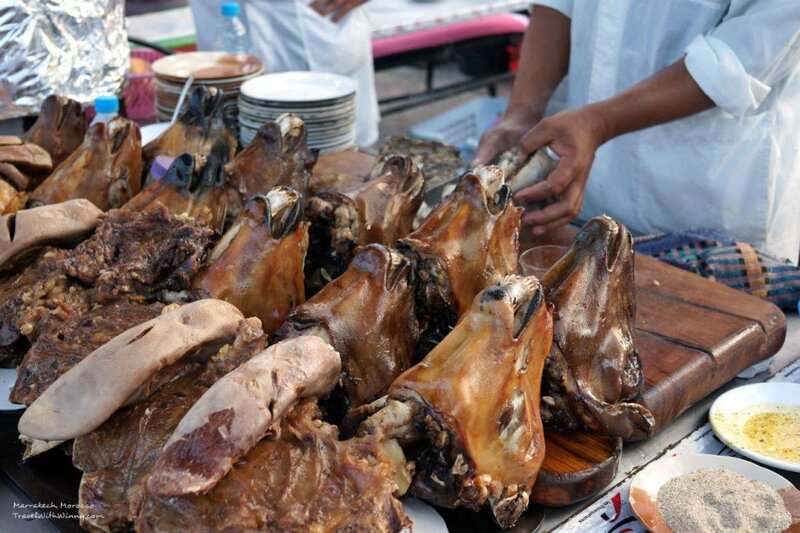 I find that Moroccan lambs are quite delicious since they are fully organic. 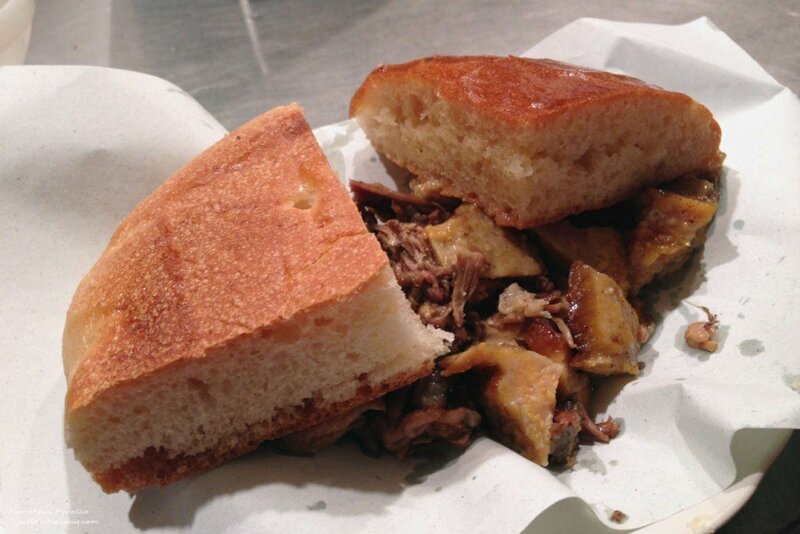 Even though the lamb head was delicious, some breads were needed to take away the greasiness of the food. Completely chopped up, couldn’t tell what it was. We also tried the lamb brain. It tasted quite soft and slightly tasteless. It’s pretty much the same texture as pig brain (if you have ever tried it before). The brains were chopped finely before serving it to us as well. I asked if I could have a picture with the brain, so the waiter got me a plate with a complete brain so I can take pictures with it. We later heard from other people that you can order any parts of the lamb from stalls like this, including lamb eyes. Unfortunately we didn’t know that and as an optometrist I don’t know how I feel about eating an eye that size. The lamb brain was actually a lot smaller than I thought. 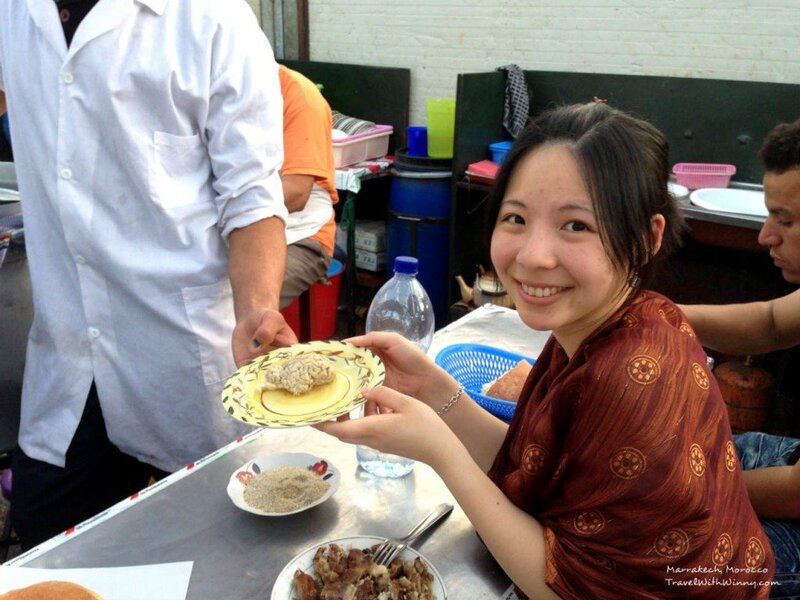 The next day we decided to try more lamb head, this time at another stall. The stall York choose had no greeters or tourists. We were surrounded by locals and we just said 1/4 lamb head, then they understood. To my surprise, this was a lamb head sandwich. No knife or fork were given! I was shocked! I wasn’t sure if I could eat the lamb head with my bare hands without sanitizing them first. After few seconds of dilemma, I decided to join the locals. It was an interesting experience and I am glad we didn’t get any food poisoning. First culture shock. The lamb head sandwich. The other snack I fell in love was the snails. Small bowl for 5DH and large bowl for 10DH. Although after trying out 3 different stalls, we were genuinely confused about the actual portions. They varies quite a bit. You pretty much pick out the snail with a toothpick and drink the soup. Apparently the Moroccans don’t treat the snails like snacks, instead they treat them as a health supplement. Although I am yet to find out what health benefits does it give. There were also a row of tea selling stalls in front of the food stalls. The teas were made from different herbal ingredients such as ginseng, cloves and cinnamon. It tasted very healthy and was 5DH per cup. The stall we picked were run by 3 elderlies who were very friendly. He kept posing for us and took pictures for us as well. He was a funny man. They also sell herbal cakes for 10DH each, it has the same ingredients as the tea. The herbal taste is more condensed in the cake, which could be quite overpowering for some people. It reminded me of chocolate brownies. 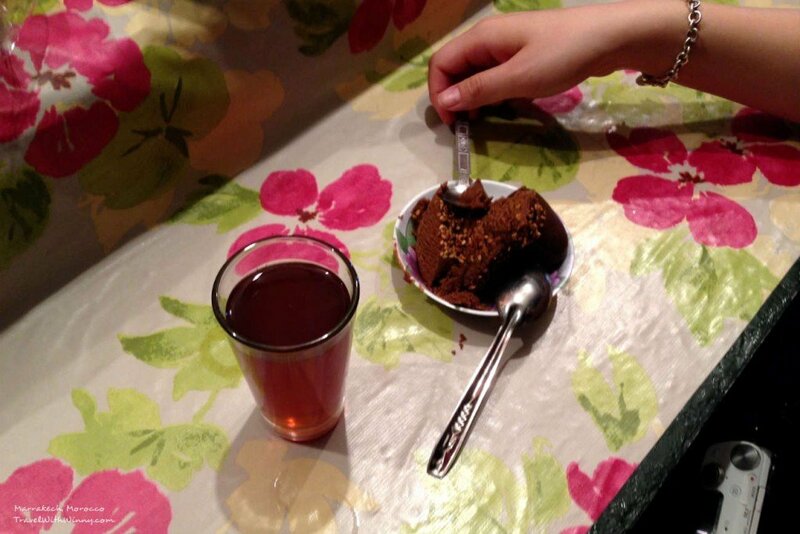 The herbal tea and herbal cake. Even though the old man was friendly, he wasn’t particularly honest. The second night we went back and ordered the same thing, he charged us 5DH more. It wasn’t until York and I gave him a very bad look, he then gave us the change. It wasn’t a large amount, however we would prefer people here being more honest. The old man took a few pictures for us. 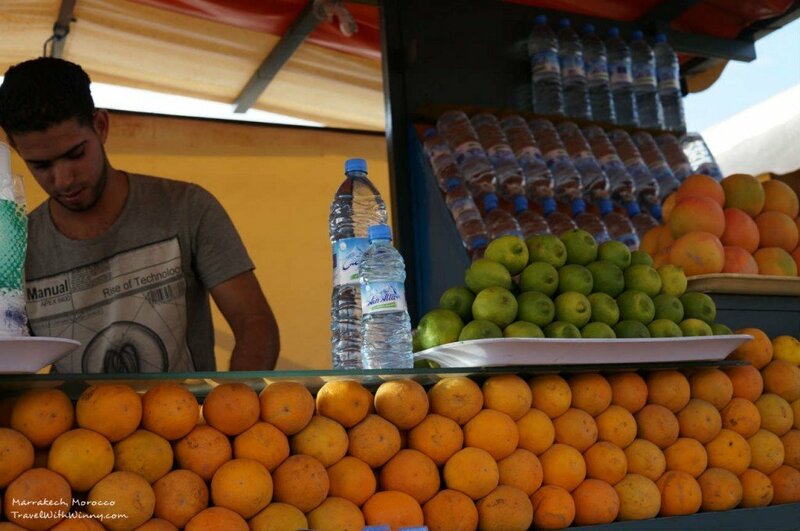 There were also many stalls that sells orange, grape fruit and lemon juices. Normal orange juices costs 4DH per cup and grape fruits & lemons costs 10DH per cup. They juices were fresh and tasted refreshing, however many would dilute the juice with water or lemonade. We bought from 3 different stores and all the grape-fruit juice tasted quite different. It was impossible to see them making juices as the oranges in front of the stalls were stacked up so high and blocked any potential views. Heaven for people who love fresh juices! We finally found a stall where we could see what was going on from the back. We saw him pressing the juicer a few times and pour the remaining juice into a cup from a container! We weren’t sure if the contents from the containers were pre-made or lemonade. A by-passer saw us looking at the juice-making person from behind, he actually went and told him we were watching. He quickly turned around yelled something at us. We just walked off. However from that moment onwards, we stopped buying juices from Djemma El-Fna. I am sure they would give the locals fresh juices, it’s just that with tourists, they just have to scam us in some ways. The oranges were stacked up so high it was impossible to see what they were doing. 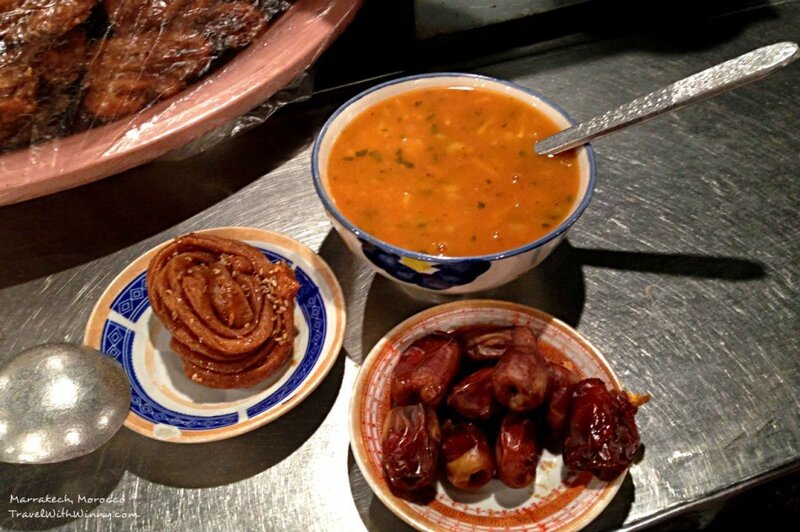 After eating the lamb head, we got our 10DH change and bought a Harira soup, a plate of dates and chebakia. 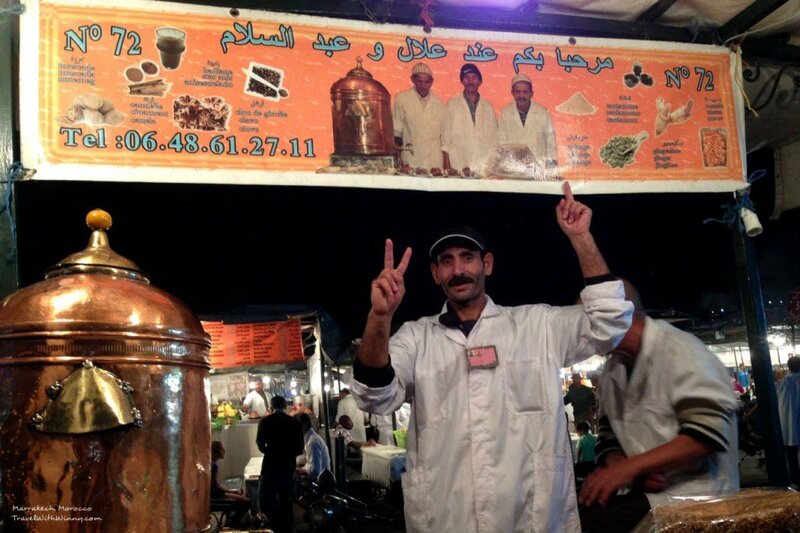 The only 3 things this stall sells and at 3DH each. We starting to learn how to eat cheaply like a local. Indeed if you go to restaurants made for tourists, you will enjoy English service and free wifi, however to pay 2-3x the price, I don’t think it is worth it. Harira soup is a local cuisine with diced meat, lentils, chickpeas and varies vegetables. 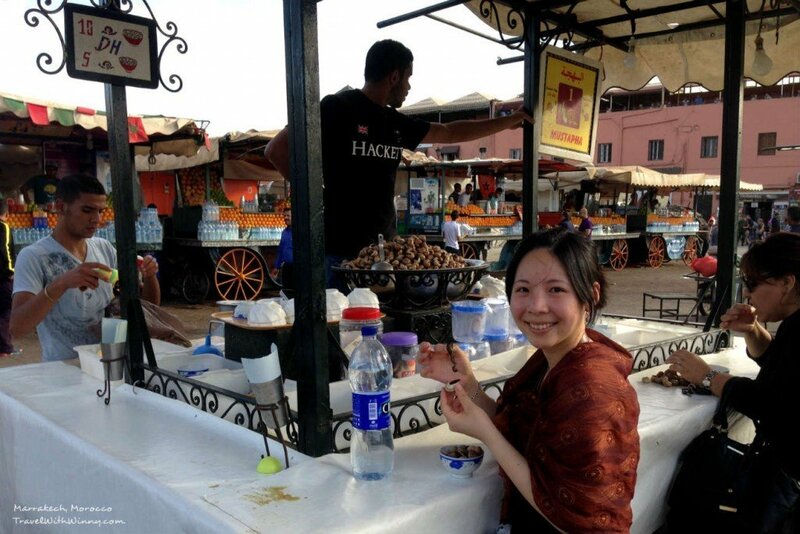 We had our first Harira soup in Essaouira (Read here if you haven’t already: Essaouira: Our Seafood Heaven in Morocco). Chebakia is a dough fried in a twisted shape and sprinkle with honey and sesame. Both Chebakia and dates tasted quite sweet. If you just want to walk around the stall and can’t stand the greeters harassing you, you can simply tell them you have eaten. This is usually enough to stop them chasing after you. However every time York says this, they would touch his stomach and said he is still skinny, can eat a lot more. After being touched by men 5-6 times, York had enough. We just went back to our riad to get some peace and quite. 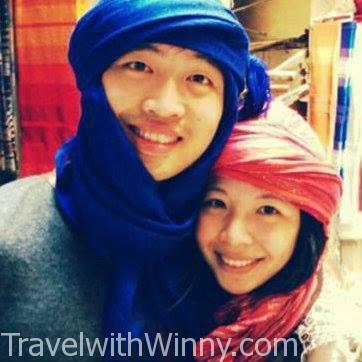 We were pretty happy with our experience in Marrakech, can’t wait for our trip to Sahara Desert! Mission completed! All the food list ticked! Yay! Thank you for reading! If you enjoy our blog or find it useful, please share my story or like my Facebook Page to get live updates of my trip and subscribe to read my latest posts! Ciao! Our 2D1N Colca Canyon Bus Tour Experience!